This also occurs with armed professionals. Does your work holster have retention devices? Then that’s what you should train/practice with. The other side of the coin is that most officers also carry off-duty, which makes it a little more complicated. 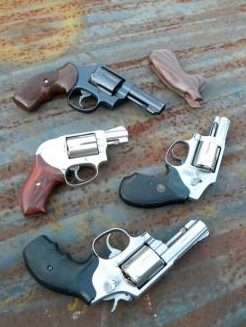 Since one can never predict when you may need the pistol it’s a good idea to work with both duty and off-duty weapons and gear. 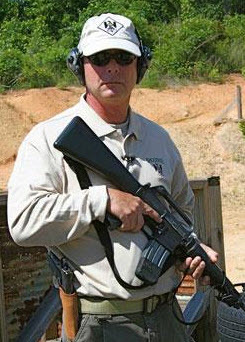 We attend training to learn tactical skills – moving, communicating, the use of cover, shooting under a variety of conditions and learning to think under stress. Regardless of why you carry a weapon these fundamentals are pretty much the same and apply across the board; they may vary slightly in their actual application according to what your job is. Training also provides an opportunity to learn how your gear works. You’re not only learning new skills but also searching for any problems that can be corrected in advance. 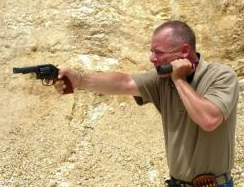 On the range, during single hand manipulations simulating injury drills, you determine that you can’t cycle the pistol’s slide by hooking the rear sight against your floppy holster. Learning about this problem during training means you can get a better holster as opposed to finding out during a fight that your gear doesn’t work. Pinpointing a potential problem in advance is very valuable. This applies to gear, physical skills, and especially the mental aspects of personal combat. To fight effectively you must be intimately familiar with your gear. True, you need to know how to operate any type weapon you may acquire. But, training/practicing with one type pistol and then carrying something completely different creates an ideal situation for difficulty. In a confrontation there are plenty of things to think about without your equipment adding to the list. Spend most of your time with what you normally carry. I like leather holsters, belts, and mag pouches, and it takes an artist to create leather gear that works well and looks good. Assembly line products function well, but there is a difference between that and a piece of gear that was created by someone who worked with care through each step of the process. 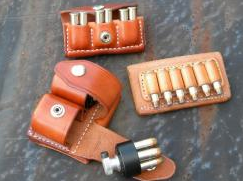 For this type leather Bill McLennan, www.texasholsters.com, is at the top of the list. Bill was one of the original “Death Cheaters,” a nickname for instructors at the Thunder Ranch Texas (TRT) location. I met him during my first class there, and after I became an instructor there I got to know him well during hours spent around the “campfire” at the instructors’ bunkhouse after classes. He is a true Texas gentleman, one of the most knowledgeable men I know when it comes to art of gunfightin’, and a gun-leather artist. Texas Holsters has a limited product line, which is the way Bill likes it. He makes holsters for 1911’s, the Glock 22 and 27, S&W 2 inch J frames, and 4 inch barrel K and N frame Smiths. They come in smooth-side out or my favorite, rough side out, and any color as long as it’s natural color leather; he doesn’t dye or work with “drum” dyed leather. Bill offers a couple of outside the waistband style holsters, which work well for concealed carry, and inside-the-waistband models for more concealment. A good holster requires the proper belt, and Bill offers these as well as mag pouches, slings, and nice cuffs for shotguns and lever actions. 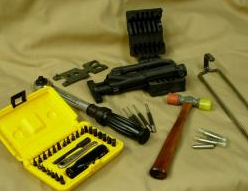 I own several examples of Bill’s work, and for carry they fit and function as it should. Bill’s leather also looks good, which is why I use it for my Sunday go to meetin’ leather. After all, there are times when my work leather, which sees constant use and abuse, just doesn’t meet the dress code. Check out Bill’s website, and if you see something you like get with him at texasholsters@gmail.com. But I have to warn you, Bill is through and through Texas, which means he doesn’t have a lot of time for idle chit-chat, so for my sake don’t waste any of his time. On Bill’s website it says: “Gun Leather: made by hand, by one man, one piece at a time.” For fine leather that will withstand actual use and looks good this is the way it should be. The tactical clothing of today traces its roots back to outdoor sports, especially “alpine” style mountaineering, an aggressive method of attacking a climbing objective carrying only the bare essentials, operating without any additional support or bases. If you need it, you hump it. This sport requires lightweight clothing that provides protection against harsh terrain, water, wind and cold while allowing climbers to perform complicated physical tasks. As this gear became more mainstream the hunting and tactical communities recognized its advantages. Today these high-tech materials and designs from the extreme sports have been successfully adapted for everything from suburban bicycling to the most rigorous forms of combative and tactical training. A perfect example of the evolution from sport to tactical is Wild Things, a company started in 1981 by two climbers focused on making rugged lightweight climbing gear. 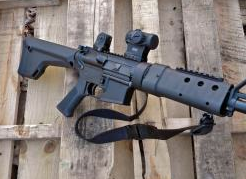 Wild Things Tactical (WTT) is a line of gear specifically for combative applications. For example WTT’s Hard Shell Jacket, the SO 1.0, is designed to be worn over body armor and helmets, yet still create a slim profile. All zippers are waterproof, including the pockets. There are two open-air mesh pockets inside, along with vent zippers on the sides. The hood is fully adjustable and has a laminated brim, a feature I consider essential. I usually wear a beanie cap in the cold. A hood without a brim will constantly slide forward and cover up my eyes. The Hard Shell pants are made to the same specs as the coat, and cut to be close fitting. A slim profile allows you to move more naturally without snagging and catching on objects in your environment. A gusseted crotch makes kneeling and squatting easy. They also have suspender loops, a mandatory feature on my outer pants. The waist of my outer shell must be loose enough that I can get to the gear on my belt underneath the pants or the pockets of my regular pants. With the outer pair this loose I need galluses to keep them from dropping down to my ankles. The pants have zippers up to the knees so getting the pants off and on over boots is easy. WTT produces jackets and pants in a variety of different styles and weights. Their SO 1.0 Soft Shell jacket is constructed from a “four-way stretch nylon/spandex blended fabric” with a “hydrophobic polyester fleece” lining. Each sleeve has a shoulder and forearm pocket, and the sides have pit zips. The stow-away hood can also be worn over a helmet and is cut to provide the wearer with as wide a field of view as possible. This jacket stands alone, or you can layer it under the Hard Shell for protection from anything shy of artic like conditions. There’s no tellin’ the weather when trouble comes knockin.’ Don’t let the climate and terrain become a threat or a negative aspect to deal with when faced with dangerous situations. Protecting ourselves from the climate and environment is an easy option, and can provide an immense advantage over a less-equipped adversary. Selecting the gear you use should involve a lot of thought, research, and testing. Each piece of gear you choose is part of the chain; the chain is only as strong as its weakest link. When it comes to picking your kit, nothing is considered “small.” In a fight, every piece of gear is critical. Also keep in mind as you train/practice your views on equipment will change. There will probably be a box of gear left over once you have arrived at the spot where your gear will do everything you need. The more you learn the more you’ll realize how your gear must function. As you learn through training and practice your thoughts on gear will evolve as well. Eventually you start working on single hand manipulations. 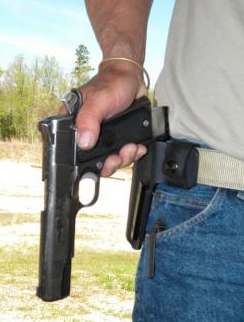 The holster now serves as an edge to hook the sights of your pistol on to cycle the slide, and you determine that holster “B” doesn’t work very well. Holster “B” isn’t stiff enough to hold up against the force necessary to cycle the slide, and it has a lot of curved edges without a flat spot to properly hook the sight on. 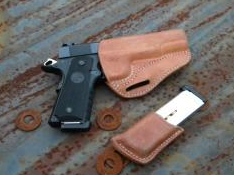 After more research you purchase holster “C.” About now you’re getting close to what will actually work for you, although it may be necessary to work with three or four other holsters similar to “C” to find the one best suited for you. Another important factor is simplicity. There is enough to think in a fight without adding complicated equipment to the list. Take flashlights for an example. I need a simple flashlight with a button you push for momentary light, and a way to turn it on for constant illumination. Lights requiring a complicated series of pushes in the proper sequence to select what type light is activated or switches of some sort to regulate the light – low level momentary light, a bright constant output, a strobe effect, … – are too complicated for me. In theory these options may be a good idea. 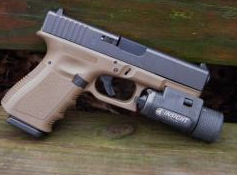 Reality is that these lights are too complicated for people to operate during low-light drills on the range, much less when someone is trying to put the hurt on you. You’re working the light while moving, using cover, shooting and manipulating your weapon as necessary. Trust me, simple is good. Discover what works for you. 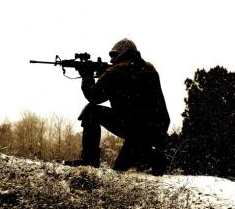 Your gear must function under all type conditions, not just a sunny day at the range. It has to work every time, without a lot of thought. When you discover inadequacy, correct it, regardless of cost. The alternative is much more expensive.